Muhammad Yusuf Khan (born December 11, 1922), better known as Dilip Kumar, is an Indian film actor, producer, screenwriter and activist, known for his work in Hindi cinema. Popularly known as The Tragedy King and The First Khan, he has been credited with bringing realism to film acting since his first film and is regarded as one of the greatest actors of world cinema. In 1976, Dilip Kumar took a five-year break from film performances and returned with a character role in the film Kranti (1981) and continued his career playing leading roles in films such as Shakti (1982), Mashaal (1984), Karma (1986) and Saudagar (1991). His last film was Qila (1998). He has won nine Filmfare Awards and is the first recipient of the Filmfare Best Actor Award (1954). Critics have acclaimed him as one of the greatest actors in the history of Indian cinema. Dilip Kumar had a long relationship with actress Madhubala but never married her. He married actress Saira Bano in 1966. He and his wife currently live in the Bandra suburb of Mumbai in the state of Maharashtra in India. Kumar was born Mohammad Yusuf Khan to Ayesha Begum and Lala Ghulam Sarwar Ali Khan in a Muslim Hindkowan-Punjabi Awan family of 12 children on 11 December 1922 at home in the Qissa Khawani Bazaar area of Peshawar, British India (modern-day Khyber Pakhtunkhwa, Pakistan). His father was a landlord and fruit merchant who owned orchards in Peshawar and Deolali. Mohammad Yusuf Khan was schooled at Barnes School, Deolali, Nashik. He grew up in the same religiously mixed neighbourhood as Raj Kapoor, his childhood friend, and later his colleague in the film industry. In 1940, while still in his teens and after an altercation with his father, Mohammad Yusuf Khan left home for Pune in Maharashtra. With the help of a Parsi café-owner and an elderly Anglo-Indian couple, Kumar met a canteen contractor. Without letting on his family antecedents, he got the job on the merit of his knowledge of good written and spoken English. He set up a sandwich stall at the army club and when the contract ended, he headed home to Mumbai, having saved Rs. 5000. In 1942, anxious to start a venture to help his father with household finances, he met Dr. Masani at Churchgate Station, who asked him to accompany him to Bombay Talkies, in Malad. There he met actress Devika Rani, owner of Bombay Talkies, who asked him to sign up with the company on a salary of Rs. 1250 per month. There he met actor Ashok Kumar, who influenced his acting style by telling him to act "natural". He also met Sashadhar Mukherjee, and both of these people became close to Kumar over the years. Initially, Kumar helped out in the story-writing and scripting department because of his proficiency in Urdu language. Devika Rani requested him to change his name to Dilip Kumar, and later cast him in a lead role for Jwar Bhata (1944), which marked Kumar's entry into the Hindi film industry. 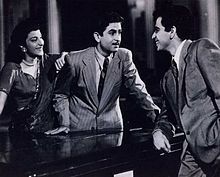 Nargis, Raj Kapoor and Dilip Kumar in a scene from the film Andaz (1949). Portrait of Dilip Kumar in 1946. Dilip Kumar in Devdas (1955). He was the first actor to win the Filmfare Best Actor Award (for Daag) and went on to win it a further seven times. He formed popular on-screen pairings with many of the top actresses at the time including Madhubala, Vyjayanthimala, Nargis, Nimmi, Meena Kumari and Kamini Kaushal. 9 of his films in the 1950s were ranked in the Top 30 highest-grossing films of the decade. In the 1950s, Dilip Kumar became the first actor to charge ₹1 lakh (equivalent to ₹79 lakh or US$110,000 in 2018) per film. In 1960, he portrayed Prince Salim in K. Asif's big-budget epic historical film Mughal-e-Azam, which was the highest-grossing film in Indian film history for 11 years until it was surpassed by 1971 film Haathi Mere Saathi and later by the 1975 film Sholay. If adjusted for inflation, Mughal-e-Azam was the highest-grossing Indian film through to the early 2010s, equivalent to over ₹1000 crore in 2011. The film told the story of Prince Salim, who revolts against his father Akbar (played by Prithviraj Kapoor), and falls in love with a courtesan (played by Madhubala). The film was mostly shot in black and white, with only some scenes in the latter half of the film shot in colour. 44 years after its original release, it was fully colourised and re-released in 2004. In 1961, Kumar produced and starred in Ganga Jamuna opposite his frequent leading lady Vyjayanthimala and his brother Nasir Khan, this was the only film he produced. In 1962 British director David Lean offered him the role of "Sherif Ali" in his film Lawrence of Arabia (1962), but Dilip Kumar declined to perform in the movie. The role eventually went to Omar Sharif, the Egyptian actor. Dilip Kumar comments in his much later released autobiography, "he thought Omar Sharif had played the role far better than he himself could have". Kumar was also being considered for a leading role opposite Elizabeth Taylor in a film that Lean was working on called Taj Mahal, before the project was cancelled. His next film Leader (1964) was a below average grosser at the box office. He was the co-director alongside Abdul Rashid Kardar of his next release Dil Diya Dard Liya in 1966, but was uncredited as director. In 1967, Kumar played a dual role of twins separated at birth in the hit film Ram Aur Shyam. In 1968, he starred alongside Manoj Kumar and Waheeda Rehman in Aadmi. That same year he starred in Sangharsh with Sanjeev Kumar. Kumar's career slumped in the 1970s with films like Dastaan (1972) failing at the box office. He starred alongside his real-life wife Saira Banu in Gopi (1970). They were paired again in his first and only Bengali language film Sagina Mahato (1970). A Hindi remake Sagina was made in 1974 with the same cast. He played triple roles as a father and his twin sons in Bairaag (1976) which failed to do well at the box office. He personally regarded M. G. Ramachandran's performance in Enga Veetu Pillai better than his role in Ram Aur Shyam. He regards his performance in Bairaag much higher than that of Ram Aur Shyam. Although his performance in Bairaag and Gopi were critically acclaimed, he lost many film offers to act in leading roles to actors Rajesh Khanna and Sanjeev Kumar, from 1968 to 1987. He took a five-year hiatus from films from 1976 to 1981. In 1981, he returned to films as a character actor playing central roles in ensemble films. His comeback film was the star-studded Kranti which was the biggest hit of the year. Appearing alongside an ensemble cast including Manoj Kumar, Shashi Kapoor, Hema Malini and Shatrughan Sinha, he played the title role as a revolutionary fighting for India's independence from British rule. He then successfully collaborated with director Subhash Ghai starting with Vidhaata (1982), in which he starred alongside Sanjay Dutt, Sanjeev Kumar and Shammi Kapoor. Later that year he starred alongside Amitabh Bachchan in Ramesh Sippy's Shakti which was a hit grosser at the box office and won him critical acclaim and his eighth and final Filmfare Award for Best Actor. In 1984, he starred in Yash Chopra's social crime drama Mashaal opposite Anil Kapoor which failed at the box office but his performance was critically acclaimed. He also appeared alongside Rishi Kapoor in Duniya (1984) and Jeetendra in Dharm Adhikari (1986). His second collaboration with Subhash Ghai came with the 1986 ensemble action film Karma. Karma marked the first film which paired him opposite fellow veteran actress Nutan. Three decades earlier however, they were paired together in an incomplete and unreleased film titled Shikwa. He acted opposite Nutan again in the 1989 film Kanoon Apna Apna. In 1991, Kumar starred alongside fellow veteran actor Raaj Kumar in Saudagar, his third and last film with director Subhash Ghai. This was his second film with Raaj Kumar after 1959's Paigham. Saudagar was Kumar's last box office success. In 1993, he won the Filmfare Lifetime Achievement Award for his contribution to the industry for five decades. In 1992, producer Sudhakar Bokade announced a film titled Kalinga which would officially mark Kumar's directorial debut after he had allegedly previously ghost directed Ganga Jamuna (1961) and Dil Diya Dard Liya (1967). Kumar was also set to star in the title role with the cast including Raj Babbar, Raj Kiran, Amitoj Mann and Meenakshi Seshadri. After being delayed for several years, Kalinga was eventually left incomplete and shelved. In 1998, he made his last film appearance in the box office flop Qila, where he played dual roles as an evil landowner who is murdered and as his twin brother who tries to solve the mystery of his death. In 2001, he was set to appear in a film titled Asar — The Impact alongside Ajay Devgan, which was shelved. His classic films Mughal-e-Azam and Naya Daur were fully colourised and re-released in cinemas in 2004 and 2008 respectively. An unreleased film he had shot and completed in 1990 titled Aag Ka Dariya was set for a theatrical release in 2013 but has not been released to date. Kumar was nominated as a member of the Rajya Sabha, the upper house of the Parliament of India, by the Indian National Congress for the period 2000–2006. Kumar launched his Twitter account and his first tweet was on his 89th birthday in 2011. Dilip Kumar had fallen in love with Madhubala during the shooting of Tarana. They remained in a relationship for seven years until the Naya Daur court case happened in which Dilip Kumar stood by the Chopras who had given evidence against Madhubala and her father, thus ended his relationship with Madhubala. They never worked together after the release of Mughal-e-Azam (1960). Madhubala died from a heart disease in 1969. Dilip Kumar married actress Saira Banu in 1966, who was 22 years younger to him. He married a second time in 1981 to Hyderabad socialite Asma Sahiba, but the marriage ended in January 1983. He and his wife Saira Banu currently live in Bandra. Dilip Kumar does not have any children. He is fluent in Urdu, Hindi, Hindko (dialect of Lahnda Punjabi; his first language), Punjabi, the Awadhi and Bhojpuri dialects of Hindi, Marathi, English, Bengali, Gujarati, Pashto, and Farsi. Kumar has been involved with number of charitable and social initiatives. He planned and conceptualised the famous Jogger's Park in Bandra, along with Sunil Dutt and Oliver Andrade. Kumar used his good offices to get the necessary clearances from the Maharashtra Government for the establishment of this public park. Kumar donated a significant portion of his MPLAD fund towards the construction and improvement of the Bandstand Promenande and the gardens at Bandra Fort at Lands End in Bandra. Dilip Kumar is widely considered one of the greatest actors in the history of Hindi cinema. He holds the Guinness World Record for winning the maximum number of awards by an Indian actor. He has received many awards throughout his career, including 10 Filmfare Awards for Best Actor and One Lifetime Achievement for Filmfare Also for Special Recognition FilmFare Award for recognising him as one first recipients to receive a Filmfare Award along with the nightingale of India Lata Mangeshkar and one of the greatest Hindi Music Directors Naushad Ali at the 50th Filmfare Award Ceremony and along with 19 nominations at Filmfare for best actor. He was honoured with the Filmfare Lifetime Achievement Award in 1993. Gunga Jumna (1961), which he wrote, produced, and starred in, also received the National Film Award for Second Best Feature Film in Hindi, the Paul Revere Silver Bowl at the Boston International Film Festival, the Special Honour Diploma from the Czechoslovak Academy of Arts in Prague, and the Special Prize at the Karlovy Vary International Film Festival. Kumar was appointed Sheriff of Mumbai (an honorary position) in 1980, the Government of India honoured Kumar with the Padma Bhushan in 1991, the Dadasaheb Phalke Award in 1994 and the Padma Vibhushan in 2015. The Government of Andhra Pradesh honoured Kumar with NTR National Award in 1997. The Government of Pakistan conferred Kumar with Nishan-e-Imtiaz, the highest civilian award in Pakistan, in 1998. The ruling political party of Shiv Sena in Maharashtra had objected to this award and questioned Kumar's patriotism. However, in 1999 in consultation with the then Prime Minister of India, Atal Bihari Vajpayee, Kumar retained the award. He was honoured with CNN-IBN Lifetime Achievement Award in 2009. 2000-2006 - Elected to Rajya Sabha, the upper house of Indian Parliament. 1998 - The Government of Pakistan honoured him with its highest civilian honour, the Nishan-e-Imtiaz. Dilip Kumar: The Substance and the Shadow as narrated to Udayatara Nayar was published in 2014 by Hay House Publishers (India) Pvt. ltd.
^ "Padma Awards 2015". Press Information Bureau, Government of India. 25 January 2015. Retrieved 26 January 2015. ^ a b "Alphabetical List Of Former Members Of Rajya Sabha Since 1952". Rajya Sabha Secretariat. Retrieved 4 October 2015. ^ a b "Tragedy king Dilip Kumar turns 88". The Indian Express. 11 December 2010. Retrieved 21 June 2012. ^ a b "Happy Birthday Dilip Kumar: As Dilip Kumar turns 94, a look at his titanic reputation as India's finest method actor". Indianexpress.com. 11 December 2016. Retrieved 21 March 2019. ^ Suresh Kohli (8 January 2004). "Celebrating The Tragedy King". The Hindu. Delhi, India. Retrieved 30 January 2012. ^ a b A documentary on the life of Dilip Kumar. Bollywood Hungama. Retrieved 7 August 2011. ^ a b Sharma, Vishwamitra (2007). Famous Indians of the 21st Century. Pustak Mahal. p. 196. ISBN 81-223-0829-5. ^ a b Dawar, Ramesh (2006). Bollywood: yesterday, today, tomorrow. Star Publications. p. 8. ISBN 1-905863-01-2. ^ "'The King of Tragedy': Dilip Kumar's 92nd birthday celebrated in the city". The Express Tribune. 11 December 2014. Retrieved 12 December 2014. ^ Ali Hazrat Bacha (12 December 2015), "Dilip Kumar’s birthday celebrated at birthplace", Dawn News. 23 June 2018. ^ TNN (1 December 2017), "Dilip Kumar: Interesting chapters of the actor's life", The Times of India. Retrieved 23 June 2018. ^ Renuka Vyavahare (28 December 2011). "Here's why Dilip Kumar speaks Marathi fluently!". Articles.timesofindia.indiatimes.com. Retrieved 28 September 2013. ^ Kumar, Dilip (2014). The Substance and the Shadow an autobiography (1 ed.). India: Hay House India. p. 102. ISBN 9789381398869. Retrieved 18 October 2015. ^ a b Kumar, Dilip (28 July 2014). "Dilip Kumar: The Substance and the Shadow". Hay House, Inc. Retrieved 9 April 2017 – via Google Books. ^ a b "BoxOffice India.com". Web.archive.org. 6 February 2009. Retrieved 21 March 2019. ^ "Dilip Kumar's Top 25 Films". Rediff.com. Retrieved 21 March 2019. ^ a b "rediff.com, Movies: Tragedy King Dilip Kumar". Rediff.com. Retrieved 6 August 2012. ^ "Dilip Kumar's autobiography reveals his journey from Peshawar to Bombay - The Indian Express". Web.archive.org. 28 March 2017. Retrieved 21 March 2019. ^ a b "Dilip Kumar's most memorable performances". Filmfare.com. Retrieved 21 March 2019. ^ "Mehboob's AAN (1952) – Indian Cinema's entry into Europe". Moviemahal.com. 11 January 2017. Retrieved 21 March 2019. ^ "Filmfare Best Actor Awards - History". Indicine.com. Retrieved 9 April 2017. ^ "10 Bollywood Actors who Have Won the Highest Filmfare Awards". Foraywhile.com. 3 September 2013. Retrieved 21 March 2019. ^ Pandya, Sonal. "Dilip Kumar and his leading ladies". Cinestaan.com. Retrieved 21 March 2019. ^ "B-Town rewind: The tale of the first Bollywood crore". Mid Day. 16 March 2014. ^ "Dilip Kumar's Hollywood dis-connection". The Times Of India. Retrieved 2 December 2010. ^ "Dilip of Arabia?". The Times of India. Retrieved 21 December 2015. ^ "Idea of Dilip Kumar, Elizabeth Taylor pairing scared Saira". India Today. 13 December 2015. ^ Box Office 1964 Archived 10 February 2012 at the Wayback Machine. Box Office India. Retrieved 31 July 2011. ^ Box Office 1972 Archived 10 June 2007 at the Wayback Machine. Box Office India. Retrieved 31 July 2011. ^ Box Office 1976 Archived 20 October 2013 at the Wayback Machine. Box Office India. Retrieved 31 July 2011. ^ "BoxOffice India.com". Web.archive.org. 1 February 2009. Retrieved 21 March 2019. ^ a b Top Earners 1980–1989 (Figures in Ind Rs). Box Office India. Retrieved 31 July 2011. ^ "When thespian Dilip Kumar floored Yash Chopra with his performance!". Glamsham.com. Retrieved 21 March 2019. ^ Bali, Karan (16 September 2017). "Incomplete Films: Shikwa". Upperstall.com. Retrieved 21 March 2019. ^ "rediff.com, Movies: Forever Nutan". Rediff.com. Retrieved 9 April 2017. ^ Top grossers of 1991 (Figures in Ind Rs). Box Office India. Retrieved 31 July 2011. ^ "Revealing Dilip Kumar's unfulfilled dreams". Dailyo.in. Retrieved 21 March 2019. ^ May 31, AMIT AGARWAL; May 31, 1993 ISSUE DATE:; August 7, 1993UPDATED:; Ist, 2013 14:06. "Movie preview: Vidhu Vinod Chopra's '1942 - A Love Story' and Dilip Kumar's 'Kalinga'". India Today. Retrieved 21 March 2019. ^ Asif Noorani (11 December 2012). "Dilip Kumar: 90 fruitful years | Entertainment". Dawn.com. Retrieved 9 May 2013. ^ "The Sunday Tribune - Spectrum". Tribuneindia.com. Retrieved 9 April 2017. ^ "Unreleased 23-year-old Dilip Kumar starrer set to hit theatres soon". Hindustantimes.com/. 26 December 2013. Retrieved 21 March 2019. ^ "Dilip Kumar joins Twitter on 89th birthday". Hindustan Times. 13 December 2011. Archived from the original on 20 December 2014. Retrieved 18 September 2013. ^ "When Dilip Kumar Married Asma". Rediff.com. ^ Bhatia, Ritu (2 September 2012). "Don't mind the (age) gap". India Today. Retrieved 16 September 2013. ^ "Twitter". Mobile.twitter.com. Retrieved 21 March 2019. ^ "BBRT - Information & Issues". Bbrtbandra.org. Retrieved 21 March 2019. ^ "'Would be criminal if I stopped Saira from acting'". Rediff.com. Retrieved 21 March 2019. ^ "Dilip Kumar is my idol and inspiration: Amitabh Bachchan — The Times of India". Timesofindia.indiatimes.com. 11 December 2011. Retrieved 6 August 2012. ^ "Kumar-Guinness-World-Records-TV-show.htm Dilip Kumar on TV show?". Mid-day.com. Retrieved 21 March 2019. ^ "Things that u don't know about Filmfare Awards...(Part IV)". Sify Movies. 27 February 2007. Retrieved 14 December 2010. ^ a b "Lifetime Achievement (Popular)". Filmfare Awards. Archived from the original on 12 February 2008. Retrieved 14 December 2010. ^ The Indian Express, Meghnad Desai (2014). "Dilip Kumar's autobiography reveals his journey from Peshawar to Bombay". p. 1. Archived from the original on 28 March 2017. Retrieved 28 March 2017. ^ BBC News, India (2014). "Indian media: Dilip Kumar's Pakistan home a heritage site". p. 1. Archived from the original on 28 March 2017. Retrieved 28 March 2017. ^ The Hindu, National (2016). "Dilip Kumar's home in Pak. on verge of collapse". p. 1. Archived from the original on 13 December 2016. Retrieved 13 December 2016. ^ India Today, PTI (2015). "Dilip Kumar's ancestral home in Pakistan to be turned into a museum". p. 1. Archived from the original on 28 March 2017. Retrieved 28 March 2017. ^ "Dilip Kumar decides to retain Nishan-e-Imtiaz". Rediff.com. 11 July 1999. Retrieved 16 September 2013. ^ "IOTY 2008: ISRO boss, team Chandrayaan". CNN IBN. 3 February 2009. Retrieved 16 September 2013. ^ February 22; November 30, 2014 ISSUE DATE:; January 28, 1979UPDATED:; Ist, 2015 12:50. "Film star Dilip Kumar appointed Sheriff of Bombay by Maharashtra Governor Sadiq Ali". India Today. Retrieved 21 March 2019. Wikimedia Commons has media related to Dilip Kumar.